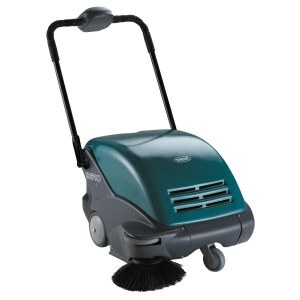 The TENNANT 3610 is a battery powered floor sweeper and vacuum. It has forward and reverse speeds, automatic filter shaker, and an adjustable height for the handle. The TENNANT 3610 has a large debris hopper that is easy to remove and no tools are required to replace the filter or brooms creating an easy and effortless maintenance unit.